As we have just launched our new telescopic iPad holder, we thought why not blog about it! 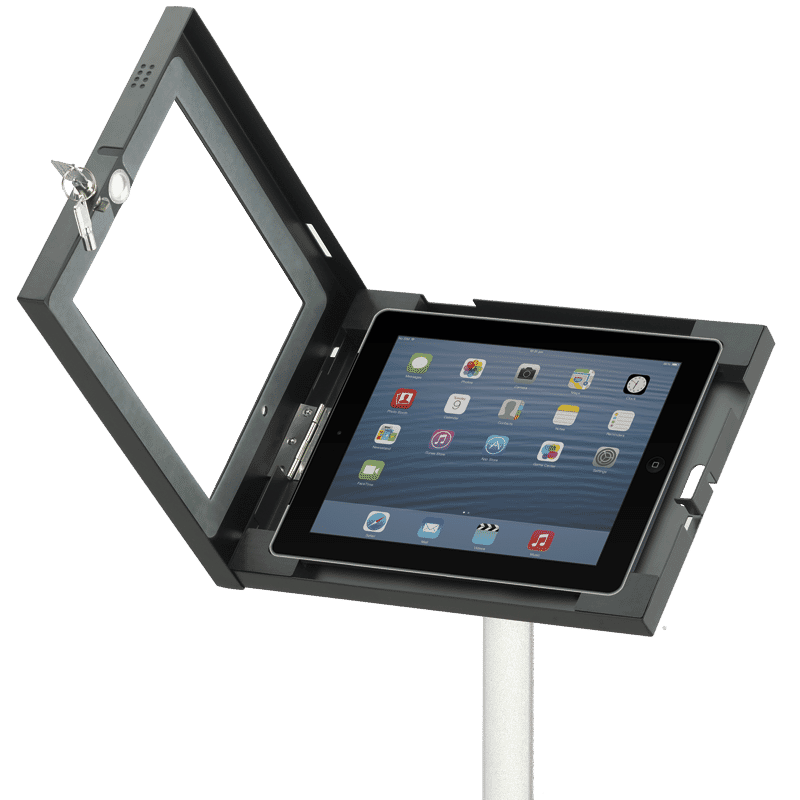 Many of you have had questions regarding our new product, so this blog sets out to inform you of all its great features and the great benefits that your customers will have from using an ipad holder. Our iPad Holder is for use with the iPad 2, 3 and 4 and also the iPad Air. It can conveniently be used portrait or landscape and has a tilt facility for optimal viewing. One of the most important aspects of this product is that it is lockable, ensuring that your expensive equipment will not get stolen, broken or interfered with. The soft silicone corners hold your iPad in place inside the lockable holder. There are also holes in the base so that the unit can be secured to the floor, making it even more protected. The home button is fully accessible once locked . Conveniently you can feed an iPad power lead through the cable management clips on the back of the pole – this facility allows the iPad to be used all day. 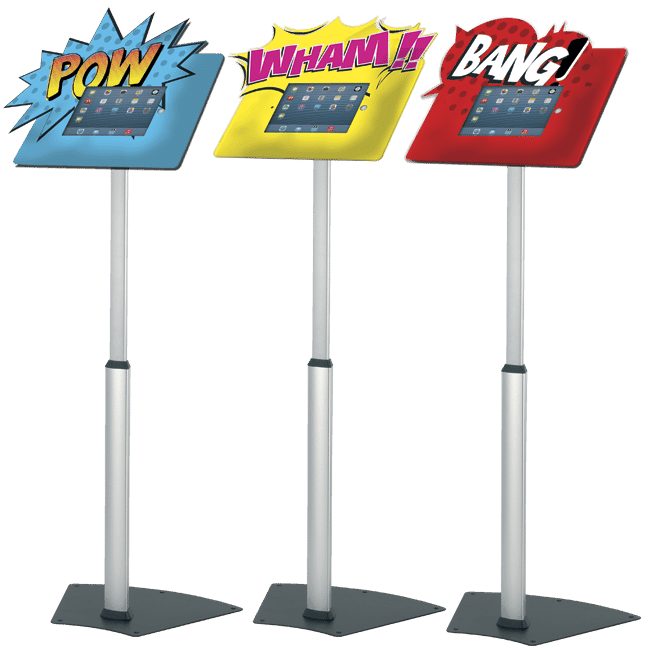 There are endless possibilities, the greatest aspect being that users can take this product with them wherever they go, this is especially good for people who constantly have a lot of presentations at different venues. An innovative, radical product like the iPad definitely should be protected and displayed in a unique way and our iPad holder is a brilliant way to do this. It also enables the user to interact with customers on a personal level. 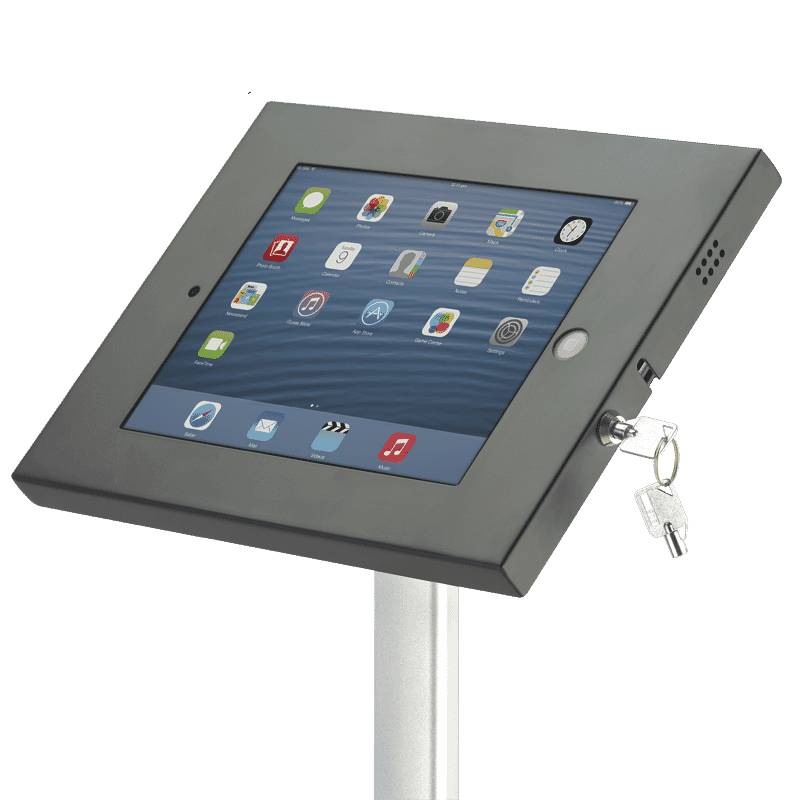 Having the use of an iPad within a holder will create interest for a customer’s business and create more movement for example within a shop, thus creating advances to a company. Why not try creating an even bigger impact by adding a graphic to your iPad Holder. It is a simple, yet effective idea and looks great. Print your graphic to foamex using our dimensions and affix with double sided tape! Easy as 1, 2, 3! Click Here to download the graphic specification pdf. For more information please click here: iPad Holder, log in for prices or give us a call!